As I was sizing up a new machine at the gym the other day, a man headed toward the ellipticals kindly mentioned that he enjoys seeing me in the newspaper every Sunday. Then he backtracked and issued a request: could I create more recipes that can easily be prepared for one person? I love it when readers give me ideas, and when the reader in question happens to be the minister who baptized both of your children, you make that request a priority. The planned stir-fry recipe can wait! My family-of-four perspective undoubtedly shapes the recipes I create, although most can easily be adjusted up or down. Leftovers are often welcome, too. But as my friend Randy said, sometimes he’d rather not eat the same thing all week. Many times, he just wants enough for one sitting. When I pressed Randy for what kind of recipes he would most enjoy, he mentioned fish and chicken. I sent him the following easy method for preparing flavorful fish (which can be adapted for use with chicken, too), and he said it was perfect. He appreciated that flavor wasn’t sacrificed for the sake of simplicity and a small yield, adding that the recipe offers a quick alternative to frozen food. Happily, this recipe can be made almost as easily for two, three, or four people. You could even make this recipe for 10 — you’ll just need a bigger pan. Randy asked that I keep the small-yield recipes coming, so if you’re a pro at cooking for one or two, feel free to send your favorite recipes my way. I’ll pass them along to Randy, and if there’s enough interest, I’d be happy to share a collection of them here, too. Though full of flavor as is, a drizzle of syrupy balsamic vinegar prior to serving adds a little something extra. To make your own version of a costly aged variety, simply simmer an inexpensive balsamic vinegar on the stovetop until reduced by about half and add a touch of honey. For specific instructions, look at this easy recipe. Coat a large skillet (non-stick or seasoned cast iron work well) lightly in olive oil and heat over medium-high heat. 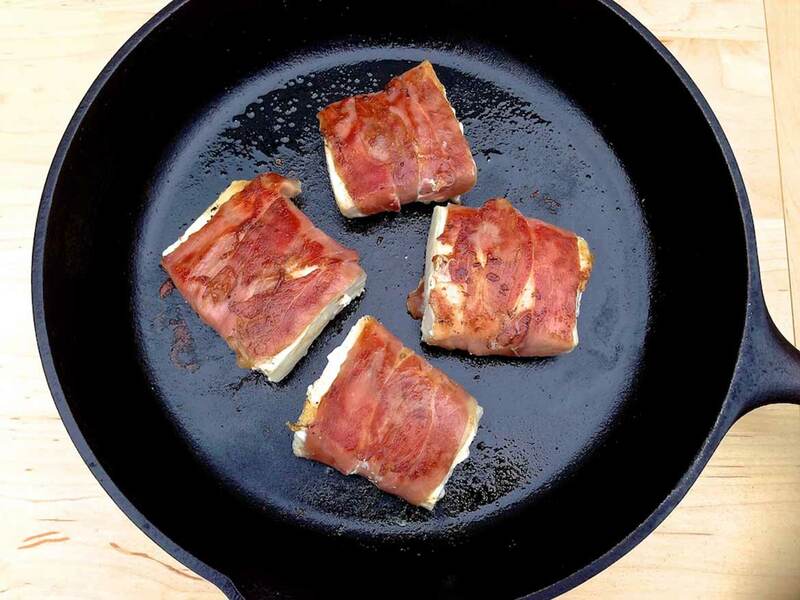 When hot, place the prosciutto-wrapped fish in the skillet and cook for 2–3 minutes on each side, until the prosciutto is golden and crispy and the fish is just barely cooked through. The fish will continue to cook a bit after it has been removed from the heat. Serve with your favorite green vegetable, a baked potato and/or a side salad…or whatever sounds good to you! *In addition to halibut–which is a firm, meaty, yet slightly sweet fish–this meal may be made with tilapia, cod, flounder, or another white fish of your choice. Depending on the thickness of the fillets, simply adjust the cooking time up or down by a minute or so. You can get a good idea as to when the fish is nearly cooked through by looking at the exposed side. 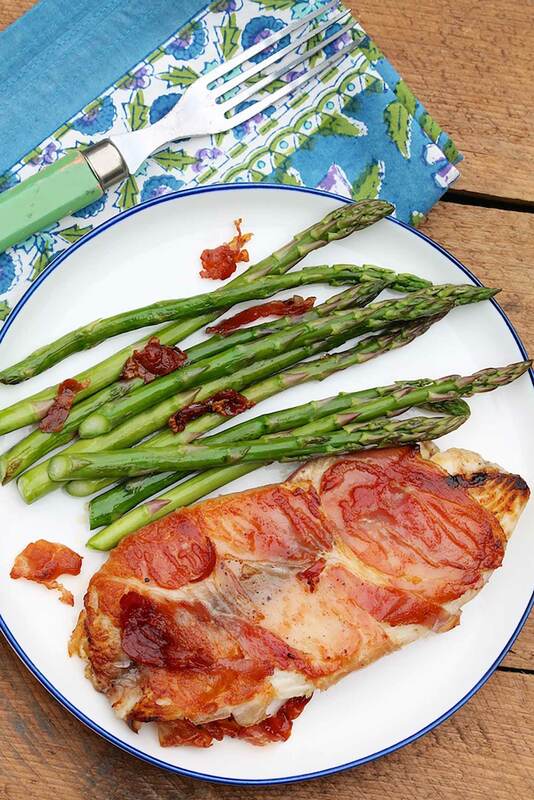 Alternatively, for a light summer meal, place the seared fish (you can even swap out the fish for thin chicken cutlets) over a bed of greens, adding chopped tomatoes and crumbled feta and a drizzle of balsamic vinaigrette. Sliced cucumbers, Kalamata olives, and slivered red onion offer complementary flavor as well. Tilapia and flounder are delicious, readily available options to halibut. 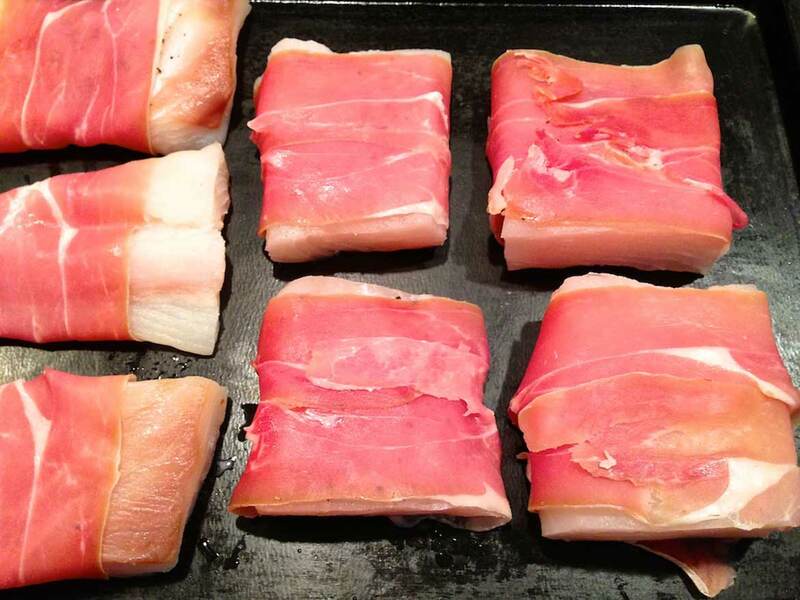 If you have a piece or two of extra prosciutto, tear or roughly chop it and then sauté it until crisp. It adds a little something special to veggies or salad served alongside. Fish is frequently on the dinner menu in my house. Not only is it healthy, delicious and versatile, it can be cooked in mere minutes, making it the best kind of fast food. If you are uncertain as to whether your fish is cooked through, don’t hesitate to make a little cut and take a peek. Unlike other meats, all the juices will not run out. I would sooner take the fish off the heat a bit early, find that it is not quite finished, and cook a bit longer. Nothing is lost, and this is better than overcooking your dinner and rendering it dry. If you are new to cooking fish, a time or two might be all it takes to make fish your go-to fast food…and this recipe is a great place to start. 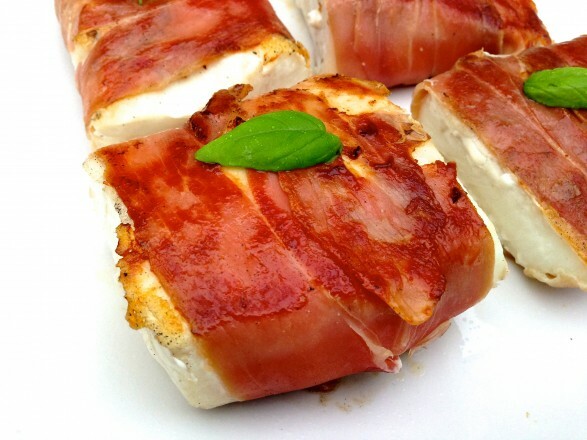 Prosciutto-wrapped chicken works well, too. Chicken cutlets cook quickly—you can purchase cutlets or make your own by slicing a large boneless, skinless chicken breast half lengthwise to form two thinner fillets. 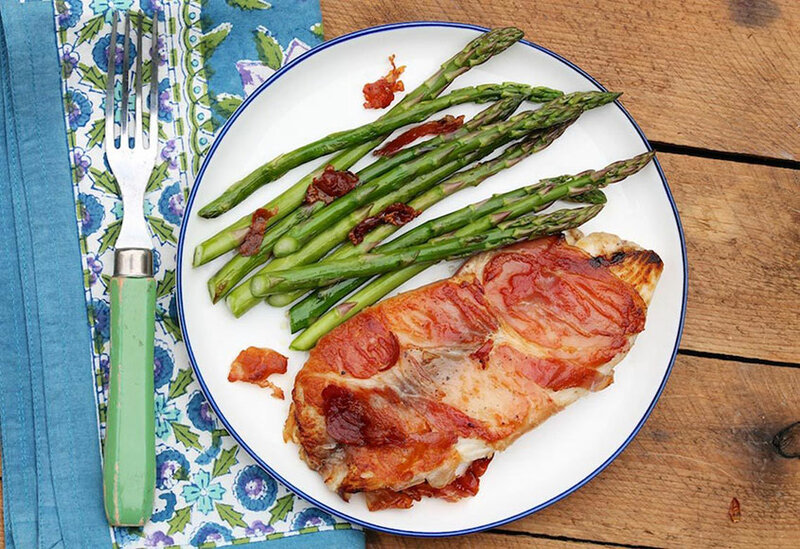 For the chicken variation, plan on 1-1/2 to 2 slices of prosciutto per piece of chicken. Precise cooking time will vary based on size and thickness of the fillet. If you like the idea of drizzling a good balsamic over the top, here is a link to my favorite inexpensive way to mimic an aged, syrupy, Italian balsamic vinegar. To turn this fish dish into a complete meal — a hearty-yet-healthy, warm dinner salad — click here. This excites me!! Will be having it for dinner tomorrow night, and drizzle with my aged, and expensive balsamic vinegar. I hope you enjoy it, Barbara! Thank you for letting me know and feel free to report back! We had this for dinner tonight. I also drizzled with a balsamic glaze. My husband had two servings! Delish! I am thrilled you both enjoyed this, Stephanie. Thanks for the great feedback! I made this for dinner tonight. Fast, easy, delicious! I’m so happy it was a hit, Kathleen! This was absolutely delicious. My husband and brother in law, who are not fans of fish, raved about it. I’ve made it twice in less than a week. Easy to prepare, takes very little time and packs lots of flavor. Thanks very much. It’s a good night when two non-fish lovers rave about a fish dinner, Elaine! Your comment is terrific. Thanks so much for taking the time to provide feedback. I’m delighted it was an all-around success!